An intriguing small news piece for you. The forthcoming DVD release (Collector’s Edition) of the Paul Thomas Anderson film There Will Be Blood, on the birth of the American oil industry, will include The Story of Petroleum among its extras. 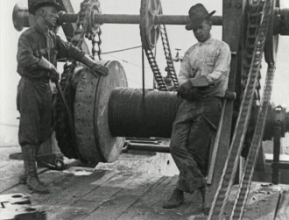 This 25mins documentary dates from c.1923 and was produced at the behest of the US Bureau of Mines and the Sinclair Oil Company (nothing to do with Upton Sinclair, whose novel Oil! forms the basis on Anderson’s film). It shows operations of the American oil industry at the time (There Will Be Blood is set in the 1890s), and comes with a score from Radiohead’s Jonny Greenwood, who also scored the main feature film. The film was presumably remade or updated from time to time, as the BFI National Archive has copies dating from 1920 and 1928. It is a typical example of the semi-instructional semi-propagandist films produced by industrial concerns for the burgeoning non-theatrical market from the 1920s onwards. The DVD (Collector’s Edition) of There Will Be Blood is released in the UK on 8 April.